Dj Knight and Girls Roc – Bar Mitzvah Party Entertainment. So it’s finally here, your son has reached the magic age when it’s time for big celebrations for their Bar Mitzvah party. We know that planning such an event can seem a daunting task but don’t worry, just call Accelerate Productions and we will take all the stress and worry out of this by providing a comprehensive, end-to-end Bar Mitzvah planning servive. Every single element of the Bar Mitzvah party will be meticulously planned, to your very specific and exact requirements. We aim to wow all our clients and give them a party that is memorable for all the right reasons. We not only deliver but exceed client expectations, allowing you to relax and soak up the atmosphere this very special day. 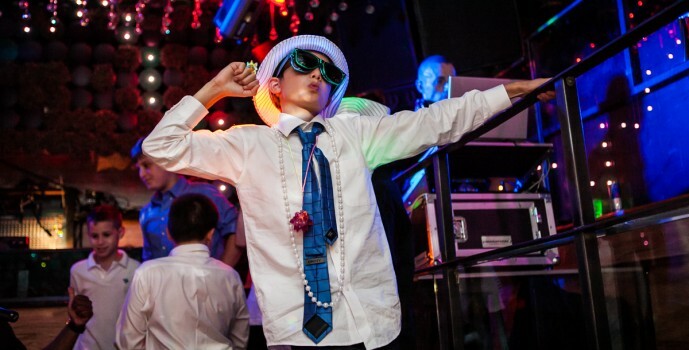 When planning a Bar Mitzvah party you will want everything to be completely perfect and run smoothly; Accelerate Productions are the ideal choice as your Bar Mitzvah party planner as they are not only able to provide what you ask for, but also can advise on every aspect of Bar Mitzvah entertainment and planning a Bar Mitzvah party. Accelerate can plan everything from the catering to the entertainment as well as everything in between. We will plan and advise on suitable entertainment for the party and have a vast database of great entertainment solutions such as Bar Mitzvah DJ, dancers, stilt walkers, football freestylers, singers, musicians – the list is endless! Why not employ the services of a choreographer beforehand so that your child can learn a dance routine to perform at the party which will be sure to impress all the guests? This never fails to wow the child’s friends and family; mum and dad could always join in too! !